A remote land bathed in silver-white, where a new destiny begins to stir. Silverwind Stretch is the location for chapters 74-79 of the main quest. A territory of the great land mass of North Vast, the most northern area of Phantagrande, with the Eoniho Mountains rising through its center. Due to its location, it is a peculiar area with even more peculiar beasts. A portion of the area, which includes the peaks of the Eoniho Mountains, is occupied by the Grim Basin. 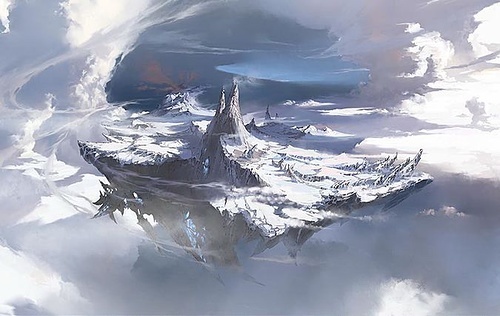 As the symbol of Silverwind Stretch, this mountain range is the largest in Phantagrande, with its outskirts forming a portion of the North Vast territory. It's considered the roughest place in Phantagrande, having claimed countless lives of explorers. Although similar to species on other islands, the monsters on Silverwind Stretch are giant in comparison. Various theories exist regarding their evolution, including adaption to the harsh conditions or even the effects of the island's primal beast. However, no cause has yet been confirmed. As the area is mostly unexplored, there are many legends about Silverwind Stretch. One of them is about a hidden village where a skyfarer was nursed back to health after attempting to climb the Eoniho Mountains. The skyfarer left after a few days, but when searching again for the village, it was never found. A violent wall of wind that divides skydoms. Its appearance dates back to the invasion of the Astrals before the War. The Grim Basin's interior spurs monsters and is filled with a highly-concentrated miasma so toxic that it can be fatal within minutes of contact. A wide snowy field whose emptiness breeds both wonder and despair into the hearts of travelers. The foot of the Eoniho Mountains. Its low visibility disorients travelers and leaves no way of turning back. Switches the position of two random allies. Wind damage to random allies. 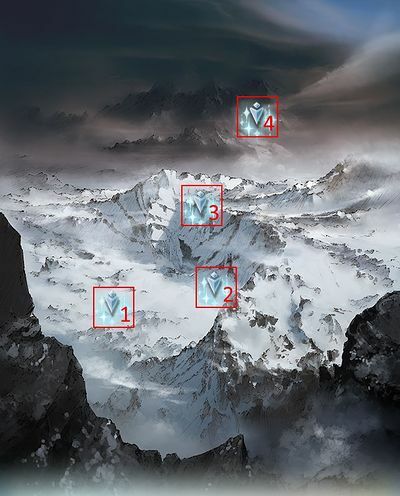 A treacherous mountainside where explorers frequently fall prey to an endless maze of white and wind. The people here have slipped quietly into the shadows of the past, and now their existence is only spoken of in legends. , and PetrifiedStops enemy's charge diamonds from filling. Massive Earth damageAround 12,000 damage to one ally. A sky-splitting boundary where only those who prove worthy may cross into the whirling miasma. Three hits to random allies, first target loses 30% charge bar. Random damage to random allies? Earth damage to all allies, switches the position of two random allies. Hailak is multi-hit with high HP, while Anissida is a heavy hitter with lower HP. Going Fire against Hailak is one way of doing it, or Light/Dark (depending on the team setup). Finish Hailak while dealing with Anissida's dmg. Keeping fear against Anissida is advisable. Location: Chapter 78: Silverwind Stretch, North Vast - Grim Basin Start QuestNetwork Errors will appear if the hosting conditions are not met. 3500 Water damage 7 times to random allies. 4000 Water damage to all allies. When spread Freeze lasts 5 turns. on all allies. 8000 Water damage 5 times to random allies. 9999 Water damage to all allies. Unleashes True Power.Gabriel has unleashed all its power! Unleashes True Power+.Gabriel gathers its last ounce of power! Base charge diamonds change to -. Casts Tidal Erasure every turnVerification needed. Drop table last updated: 2017-06-20, all stated drop rates are estimates. Near the ridge of the Eoniho Mountains. Only a handful of brave souls have ventured this far. , PersuasionInstant death for the victim. Warning! Does not work for Plain Damage! only lasts two turns, so just attacking isn't a bad idea. Ultimately it's up to the player to decide whether their time is more important than the slight damage loss. This page was last modified on 29 May 2018, at 20:49.